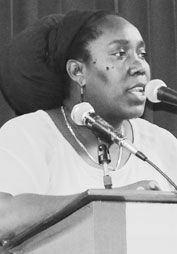 Angela Idesha Jackson, the mistress of ceremonies at the Cuba/CARICOM Day event last week, said she believes that these students fail to show their gratitude for the scholarships received at Cuban taxpayersâ expense. âI am very ashamed sometimes that the benefits that we the Vincentian graduates derived do not stand up and say I am proud, very, very proud to be a graduate of Cuba. Jackson, who Cuban ambassador Pablo Antonio Rodriguez Vidal described by as âthe Cuban who was accidentally born in St Vincentâ, said she was not just grateful because of the higher learning she received, but also grateful for the whole cultural and eye-opening experience. Jackson studied in Cuba from 2001 to 2007, earning a bachelorâs degree in accounting and finance. But she said she left Cuba with more than what any student can gain in a classroom. âWhat I had learned from Cuba is way more than a bachelorâs degree. I really have a doctorate, in that Iâve learned how to appreciate what you have and how share the little you have, and I always like to transfer the information from what the Cubans taught me,â she said. I got the opportunity to be a part of the May 1st marches, where you know why we must respect rights of workers â¦ I got to be a part of the house of economists, where I understood that itâs good to practise your profession â¦ I learned the value of voluntary work â¦ I have gained friends that have passed the relationship of friends. The former student of the Girlsâ High School and St Vincent Grammar School told SEARCHLIGHT that since returning to St Vincent she has not visited Cuba, but she hopes to return to in the not too distant future. She related that she has two other distinct connections to Cuba â her great-uncle moved there many years ago, and her cousin had a cataract removed there. Jackson further stated that she uses every opportunity she gets, to share her Cuban experiences with others. âWe give from what we have, not what we have extra, so itâs not that there is extra spaces in the university in Cuba so we want to fill them up. No, these are the spaces we have and we are going to give some to our neighbours from St Vincent, from Grenada, from Africa, from Bolivia, from Columbia, from all of the friends that I have all over the world.